Even after his death 20 years ago, Nepali modern music and singing still misses the voice and music of Narayan Gopal. Narayan Gopal died on December 5 of 1990 (19 Mangsir, 2047 B.S.) at 9 p.m. in Bir Hospital Kathmandu, at an age of fifty-one. He was suffering from diabetes but wouldn't follow strict dietary rules. After his death, no other Nepali singer has been such a versatile singer. 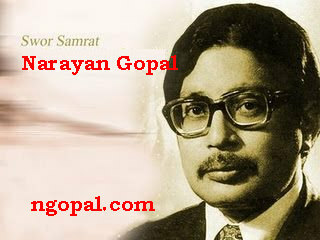 Narayan Gopal was also the first generation of Nepali singers who took music as a profession. Wide range of his voice range allowed him to sing songs of every genre of Nepali music.